A Manhattan in a bottle. This may have taken the sting out of eating barbecue in England. They laughed when told there was a recommended barbecue place in Leeds, England, but hunger drove them to seek it out. However, they held me responsible if it turned out to be worst than cold mushy peas. Kathy is especially upset when forced to eat American food in foreign places. Still thrown up to me is the worst desecration (in her mind) of all time: Eating in a McDonald’s on the Champs Elysees in Paris. 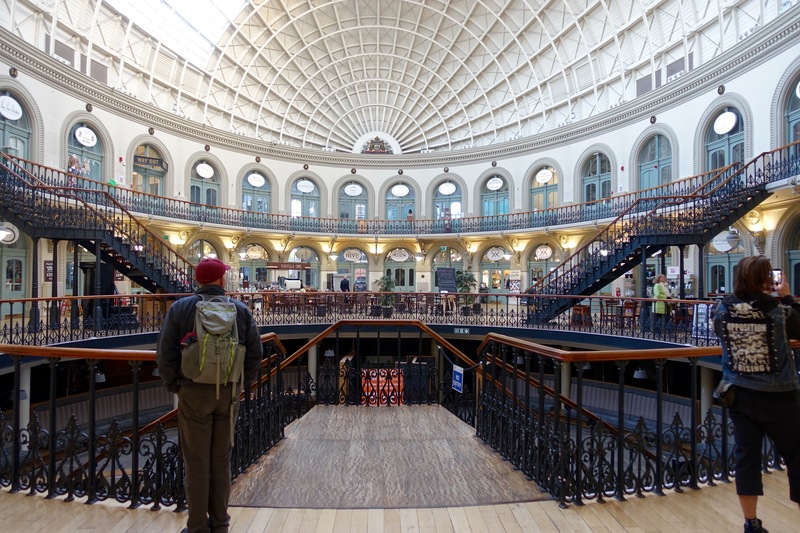 The Corn Exchange in Leeds is now filled with shops. So the five of us (we are now traveling with Dave, Tina and Ben Carpenter) moseyed around the Corn Exchange next to Red’s until it came time to face the music (American rock ‘n’ roll) at Red’s. 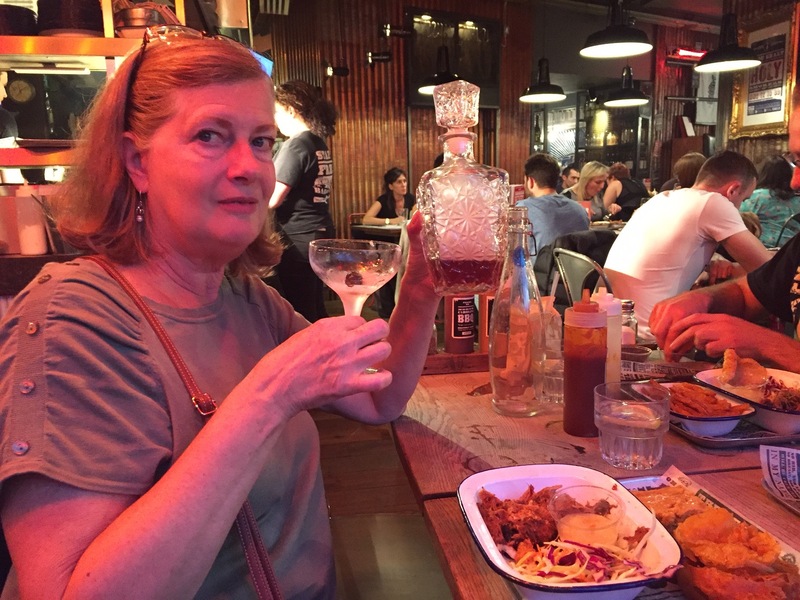 A Manhattan served in a bottle smoothed the way for Kathy. A huge selection on the menu meant something for everyone. I chose “The Sleepy James.” It was the special developed after Red’s 2014 pilgrimage to the American South. They go each year and bring back something new to share with Leeds. The Sleepy James comes from the Dodge Gas Station in Memphis, Tenn., and is named for a near toothless wanderer near the place. “Sleepy” rambled on about drinking moonshine since he was five but started making sense when the talk turned to techniques for smoking meat and fixing barbecue. The Sleepy James involved waffles, barbecued chicken, bacon and greens. It was delicious. In fact, it was all delicious, according to my four sticky-fingered traveling partners. I might get to pick a restaurant again. 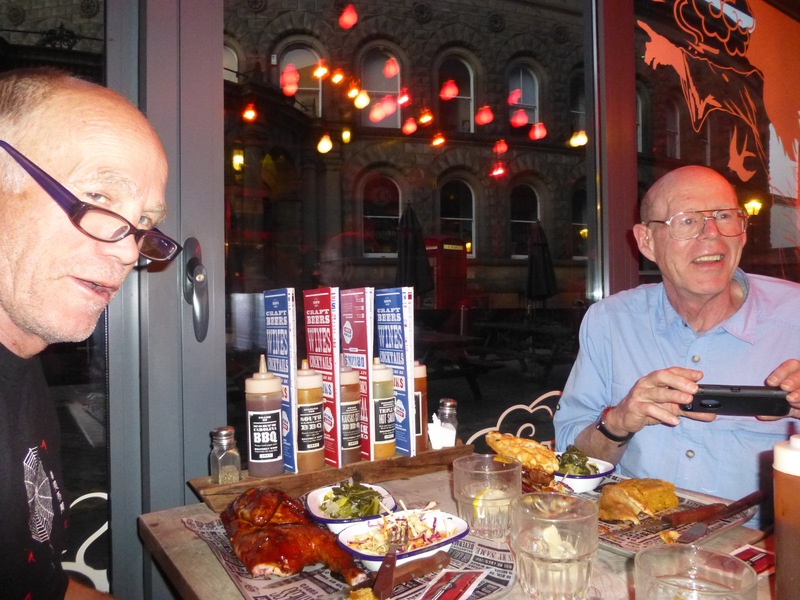 Dave and John at Red’s True Barbecue in Leeds, England. Posted on September 30, 2015 September 30, 2015 by jbsaulPosted in TravelTagged Barbecue, England, food, Leeds, Red's True Barbecue. Lovin’ that crystal decanter for the Manhattan. When next in London look for Pit Cue.